Before you can get the tools to add a pool to your houses gardens you need to have completed the Its All Going Swimmingly Quest. Once that quest is done in the garden section of the home store you will see the new pool tabs which includes building the pool, pool interior, pool paving, paver width and pool items. Building a pool is a lot like building a room but you need to remember you need at least one extra square around the pool for the paving so even though the pool can be as small as 3×3 with the paving its 5×5. And unlike rooms you can join pools together to make different shapes! Once you have built the pool you can add items to it such as inflatables and a diving board (if you have completed the diving collection for the first time) and items around the pool such as beach towels. If you have a weather machine at your house where your pool is when you put it on snow it freezes the pool so you can do the figure skating hobby! 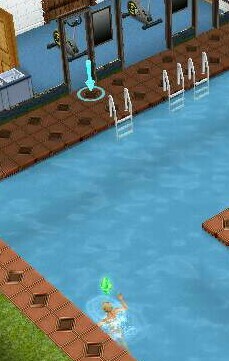 When the pool is green it will need to be cleaned, otherwise your sims will just get straight out of the water instead of doing the action you want, click on the pool and select the option clean pool. Watch this video for more information on cleaning pools and using the weather machine! You can unlock diving boards by completing the diving hobby for the first time. When you want your sim to get out of the pool click on the ground above some steps and they will get out and get changed. I recently made a pretty big pool that is “C” shaped. I’ve had both sims try and clean it many times but it’s still nasty green. Any idea why this may be or is it possibly just a glitch? It’s only happening to one house with a new bigger pool. Thanks! you have to finish it before you can build pools, you don’t have to finish it in the time limit. I have finished the quest but still dont see the pool tab in the house mode. it is in the garden section, like it says in the post. 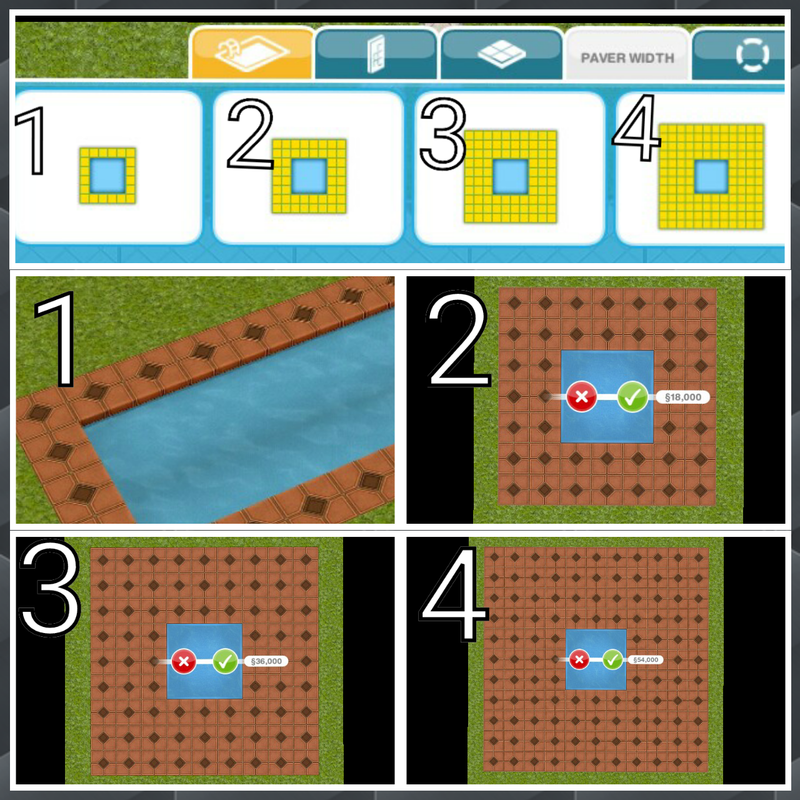 Can you explain how to create islands in the middle of the pool? I can’t figure it out for the life of me. I have just added this to the post, I hope it helps! How can i make islands in the pools? I want to make, like, a bar in the middle of the pool. Thanks im advance! BTW, great blog! Thanks for your help!! One last question, how much is the haunted house worth? I’m pretty much excited on buying it. Thanks so much for your blog 😊 with the DIY homes update, have they changed the minimum pool size like they did with the rooms? Can I built a pool inside house??? I think the house will be very beautiful if I can do that!!! no you can’t, that would be cool though! no you can’t, you will have to drag and add two squares, then drag the other side to delete two squares from that side but adding and deleting parts of the pool will cost you. I was afraid of this ….is all about money unfortunatelly! I was afraid of that ….is all about money unfortunatelly! Hi! So, I’m a little frustrated that we can’t build a pool into a patio, nor can we apparently add railings around the pool. I don’t understand the logic here at all; these should be conjoined! Is there a way to do this or should I just spam EA to update this as an option in the future? Hey I have a tip for cheaper pools! 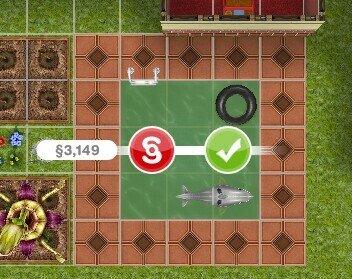 First just add the smallest possible pool and change the interior to the free one. Then make the pool bigger and it will be so much cheaper! Instead, if you want some more expensive pavings and interiors, you should change them at this points. Otherwise you’ll end up paying twice: first for the standard ones, then for the ones you actually want. Thought you might want to add this tip. Hey! Thanks for the pool island tip. I kindaimagines your voice to be high pitched or something, so it surprised me that it’s deeper. But anyway, I’ve been a fan of your blog, especially the sims tips and tricks. Thanks! I want to make a really big pool but I don’t have space as all of my backyard is taken up. Is there a way to extend the backyard? Hi! I’m on level 20 and I want to turn my toddler into a pre teen. I tried baking a cake for my toddler, the game is saying I have to complete level 15 pre teen quest. Since I’m on level 20 I don’t know if it’s possible to still complete the pre teen quest. How can I turn my toddler into a pre teen. PS: right now I’m completing the Super toddler secret mission. Thank you! You will need to complete all previous quests before you can do the preparing for preteens quest, this quest will then start automatically once you can do it. So can you place the diving board? They just won’t use it? Can they access it or is there something in the way of the back of the board? Thank you. I didn’t think there was anything behind the diving board that would be blocking it, but there was a tree. Once I moved it my sims were able to access it. Thank you! Now I just need to figure out how to connect via facebook to add neighbors that may already have the diving board. Hello, thanks for all the useful tips! Following your video I was able to build a pool with an island in the middle. Hooray! I am not able to pave it though, besides the external perimeter it is covered in grass. I tried to pave it as it was a room, and to build a minipatio upon it so that afterwise it could be paved, but no way. Do you have any tips for that? Thanks a lot in advance! Changing the paver width doesn’t get rid of the grass in the middle? That’s strange! My only other suggestion would have been to add a patio in the middle instead but it seems like that didn’t work either! I’m not sure what else to suggest, sorry! Thanks this really helps just one question how do you get so many lps so fast? No, pools can only be built on the ground. Hey this is an awesome blog! I was just wondering if there’s any way to build pools in apartments? It won’t let me but I figured that’s just because it’s not on a ground floor, is there a way to? Is there a list of all the different types of pool pavings (and patio and balcony paving so) available anywhere? 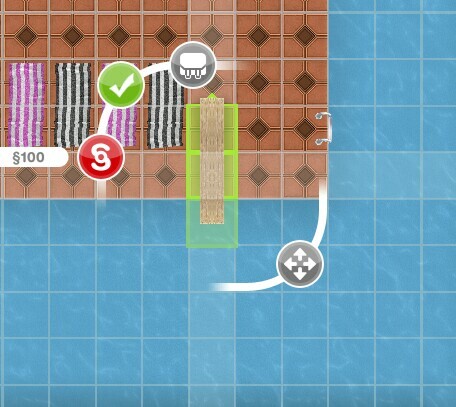 I unlocked a house via a quest a while ago and I decided I wanted to renovate the back yard pool but I can’t find the paving type anywhere in the home store. 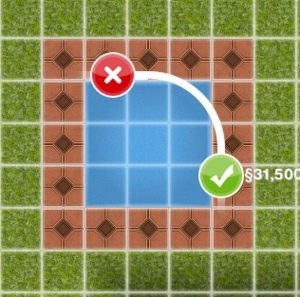 I can resize the pool and the paving stays the same, but if I try to adjoin another pool to make a different shape, the adjoined section is in the brown terra-cotta colour. I really like the colour of my patio and pool paving at this house and since it doesn’t seem to be an option in the store, I’m afraid to make any adjustments or change the colour because I know I won’t be able to change it back. I’m hoping it’s something you can unlock and I’ll get there eventually or maybe there’s some way around this issue. Any suggestions? I have just finished my buy mode outdoors catalogue: https://thegirlwhogames.blog/2019/02/07/the-sims-freeplay-buy-mode-catalogue-outdoors/ that contains all the pool and patio pavings, I am currently working on the final catalogue which is the house section so that will include the balcony paving etc. It is really annoying when it changes the paving back to the terracotta one, hopefully you will find it in the post!